This extraordinary 2-day cultural expedition takes you to the world-famous cities of Tequila and Guadalajara, as well as the small artisan community of Tonala and the enchanting Jalisco town of Tlaquepanque. You will delight in Mexican culture, history and architecture throughout this tour, with incredible scenery, ancient artifacts and traditional communities. 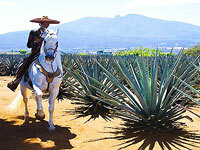 Approximately 78 km from Guadalajara lie the storied agave fields of Tequila. Known worldwide as the birthplace of the famous liquor, Tequila remains to this day the major Tequila producing region in Mexico and the world. Here we will witness the magical process of distilling tequila, taste different varieties, learn about its production and history, and of course visit the vast agave fields that yield its core. In addition we will visit the city behind the name. 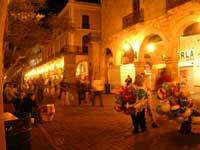 Tequila is full of traditional places, historical treasures and culture. We will take a walking tour through the town center, visiting the main plaza with its colorful Kiosco and visit the famous Church of the Immaculate Conception. Then we will make our way to metropolitan Guadalajara, the capital city of Jalisco. Once we arrive in Guadalajara, we'll take a brief tour of the historic district of the Perla del Occidente (Western Pearl). We'll visit the gardens and beautiful structures that have been built throughout its history in different periods of time. We will visit many typical places and buildings in this part of the tour. We will end at the Hotel Cervantes where you'll spend the night. The rest of the afternoon and evening are yours to explore at your leisure. On Thursday, we'll enjoy brunch at the hotel before we start the second day of the tour. We'll visit the small artisan town of Tonala, a place that shopping lovers have always dreamed of for beautiful unique handcrafted pieces and a memorable experience that you will keep forever. The last stop of this tour is Tlaquepanque, recognized as the most important artistic center in Mexico. 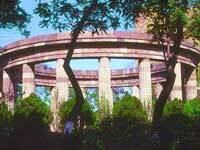 Its historical center is focused on the craft of pottery, textiles and glass blowing. Then it's back to beautiful Puerto Vallarta. Cruise Passengers: This is a multi-day tour, so is not a good option for a cruise excursion. Runs: Thursday and Fridays. Exact pick-up time will depend on the location of your hotel but will be shown on your confirmation. Departs From: Complimentary Pick-Up from your Puerto Vallarta Hotel. Extra Cash for Shopping, Meals, Tips, etc. Extra Batteries for your Camera! Kids: All ages welcome. Kids age 5-11 pay kids price. Kids under age 5 are free.